Look.com’s selection is very fashion-conscious, making it an attractive site for those of us who have a little bit of style sense of our own. The site offers a number of well-known and trendy brands like Joe’s Jeans, Diesel, Columbia Sportswear, Hurley, and Carter’s. There are 40,000 items in all ranging in sizes from zero to 14. If your child isn’t quite old enough to find his or her own style, you can do a lot of experimenting with the varied styles offered at look.com. I like that you can just as easily create an adorable preppy look, an edgy Los Angeles street look, or a look as casual as a t-shirt and jeans. Some of the gear is expensive – I’m not sure I’m enough of a high-roller to put a $100+ pair of Diesel jeans on a toddler – but if you’re willing to spend a few minutes with the site you can find a number of great deals in the outlet section. And if you do spring for that pair of designer jeans, they'll be easy to sell online when your child outgrows them. Look.com offers free 1-2 day delivery when you spend $35 or more. 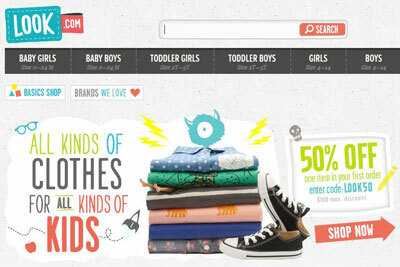 And because trying to find that perfect fit can be tough, the site also offers free returns. It’s a well-designed, well-stocked site worthy of a quick look.